Species: 35-55 μm long, 6-25 μm wide; cylindrical to elongate ovate; highly plastic; fusiform chloroplasts variable in number (Kudo, 1966). 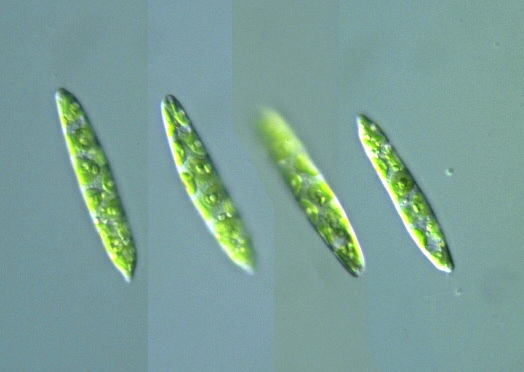 Less than 20 chloroplasts; paramylon (paramylum) body attached to each side of each chloroplast; tolerance of wide range of acidity, pH 3.5-9.9 (How to know the protozoa, 1979). 35-65 μm long, 5-15 μm wide; swim rapidly; chloroplasts 6-12 per cell, large flat, shield-shaped (Illustrated guide, 1985). Cell body fusiform or cylindrical, 40-65 μm long, 7-13 μm wide, posterior somewhat pointed, euglenoid movement active; chloroplasts saucer-shaped with wavy margin, 6-16 in number, a pyrenoid covered with paramylon sheath located at the center; a flagellum 1/2 to 2/3 of the body length; nucleus nearly spherical 7-8 μm in diam., stigma 3 μm (An Illustrated Guide to Freshwater Zooplankton in Japan, 2000).